Doing Optimality Theory brings together examples and practical, detailed advice for undergraduates and graduate students working in linguistics. 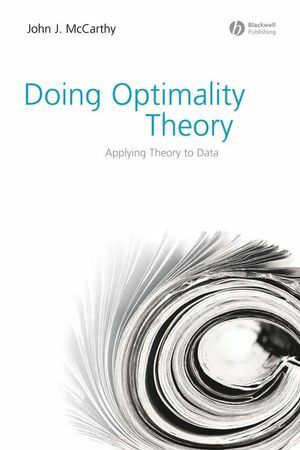 Given that the basic premises of Optimality Theory are markedly different from other linguistic theories, this book presents the analytic techniques and new ways of thinking and theorizing that are required. An ideal guide through the intricacies of linguistic analysis and research for beginning researchers, and, by example, one which will lead the way to future developments in the field. John J. McCarthy is Professor of Linguistics at the University of Massachusetts, Amherst. His widely cited but unpublished manuscript “Prosodic Morphology I: Constraint Interaction and Satisfaction” (with Alan Prince, 1993) has been an important factor in the dissemination of Optimality Theory. He is also the author of Formal Problems in Semitic Phonology and Morphology (1985), A Thematic Guide to Optimality Theory (2002), and Hidden Generalizations: Phonological Opacity in Optimality Theory (2007), as well as the editor of Optimality Theory in Phonology: A Reader (Blackwell, 2004). 1. An Introduction to Optimality Theory. 1.2 Why Must Constraints Be Violable?. 1.3 The Nature of Constraints in OT. 1.4 Candidate Sets: OT’s Gen Component. 1.5 Candidate Evaluation: OT’s Eval Component. 1.8 The Version of OT Discussed in This Book. 1.9 Suggestions for Further Reading. 2. How to Construct an Analysis. 2.2 How to Rank Constraints. 2.3 Working through an Analysis in Phonology. 2.4 The Limits of Ranking Arguments. 2.5 Candidates in Ranking Arguments. 2.7 Constraints in Ranking Arguments. 2.8 Inputs in Ranking Arguments. 2.9 Working through an Analysis in Syntax. 2.10 Finding and Fixing Problems in an Analysis. 2.11 Constraint Ranking by Algorithm and Computer. 2.12 The Logic of Constraint Ranking and Its Uses. 3. How to Write Up an Analysis. 3.2 How to Organize a Paper. 3.3 How to Present an OT analysis. 3.4 The Responsibilities of Good Scholarship. 3.5 How to Write Clearly. 3.6 General Advice about Research Topics. 4.2 When Is It Necessary to Modify Con?. 4.3 How to Discover a New Constraint. 4.4 How to Define a New Constraint. 4.5 Properties of Markedness Constraints. 4.6 Properties of Faithfulness Constraints. 4.8 A Classified List of Common Phonological Markedness Constraints. 5. Language Typology and Universals. 5.2 Languages Universals and How to Explain Them in OT. 5.3 Investigating the Factorial Typology of a Constraint Set. 5.4 Using Factorial Typology to Test New Constraints. 5.5 Factorial Typology When Con Isn’t Fully Known. 5.6 How to Proceed from Typology to Constraints. 6. Some Current Research Questions. 6.2 How Does a Language Vary?. 6.3 How Is Language Acquired?. 6.4 Does OT Need Derivations?. 6.5 How Is Ungrammaticality Accounted For?.